A tiny Plant Digimon in the shape of a poisonous mushroom. 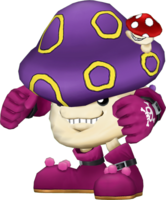 Out of Mushmon's body, it grows tiny mushroom bombs, powerful with toxins, that induce every affliction. If one gets hit with these mushroom bombs, they become unable to stop laughing, their body becomes completely paralyzed, all of their memories until now vanish, and they start showing various symptoms. As its personality is extremely ill-tempered, it loves to bully the weak, but it has a shy side, and always conceals half of its face. 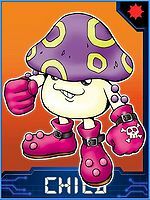 Its Special Move is releasing its tiny mushroom bombs all at once (Poison S-mush). Anime/Manga Digimon Adventure: "The Dangerous Game! 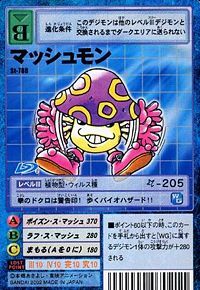 Pinochimon"
ポイズン・ス・マッシュ Poizun Sumasshu Fungus Crusher/Mushroom Mash Throws poisonous mushrooms. ラフ・ス・マッシュ Rafu Sumasshu Laughing Smasher/Giggle Grenades Poisons an enemy when hit by an attack. Throws explosive grenades in the shape of mushrooms. A Mushmon was one of the many frozen victims of Ice Devimon. 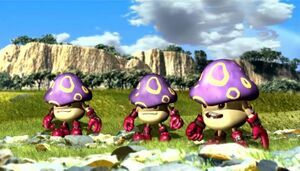 The group of Mushmon who encounter the DORUmon and bullied it since they believed that it was the cause of the instability of the Digital World. They attacked DORUmon and forced it to flee into a river. 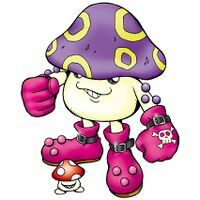 Many other Mushmon were a part of Silphymon's rebel group. Wizarmon instructed some Mushmon to take care of DORUgamon when the rebel base was under siege by some Death-X-DORUguremon but most of them were killed by the rampaging Digimon. 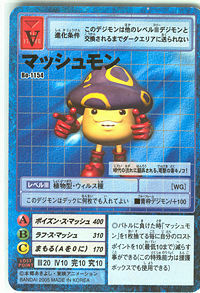 Mushmon in Digimon Xros Wars. 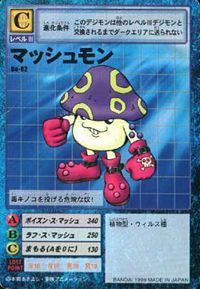 Mushmon is an obtainable Digimon. Can evolve to Vegimon (0 DP), Red Vagimon (1-3 DP) or Woodmon (4+ DP). 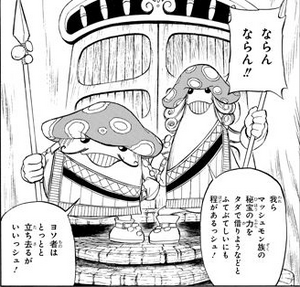 Several Mushmon appear as background elements in Fairimon's stage. Mushmon appears as an enemy in Chip Forest. 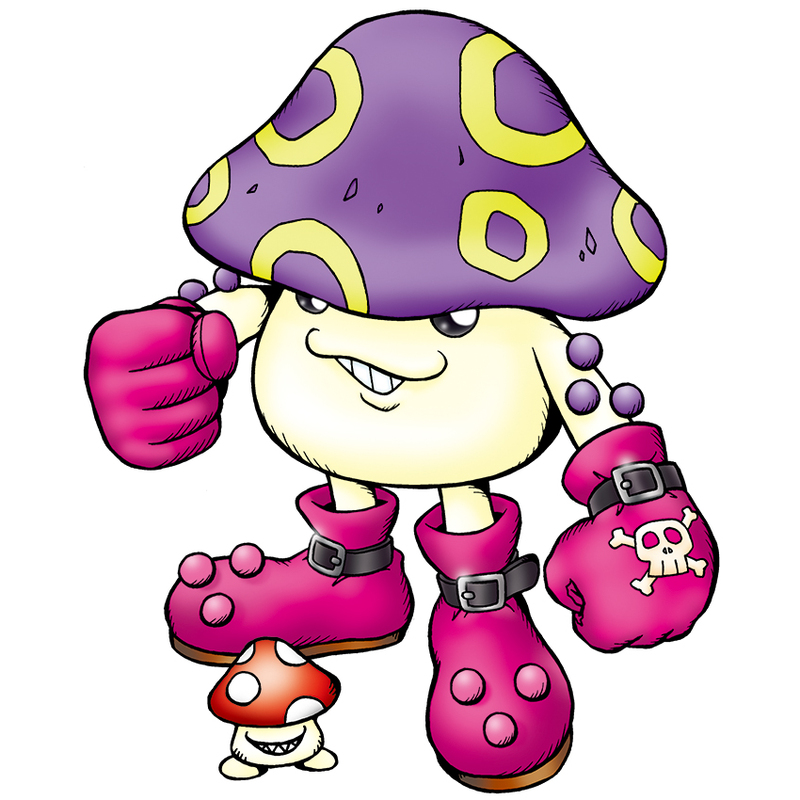 Mushmon is a minor enemy Digimon. It can only be obtained as a collectible DigiCard. 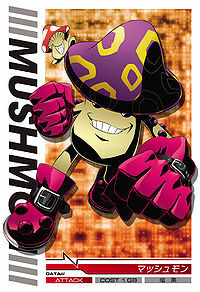 Mushmon is available as a Digimon Medal. Evolves from Pyocomon. Can evolve to V-dramon, Birdramon, Woodmon or Red Vagimon. Evolves from Pinamon. Can evolve to Igamon, Orgemon, Tailmon, or Tyranomon. The skull on its fist is a warning sign! It's a walking biohazard!! 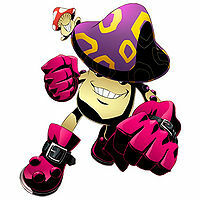 A dangerous guy who throws poisonous mushrooms! This electric-shock poison mushroom is at the mercy of the times! It grows from its body powerful mushroom bombs that inflict various conditions. It loves mischief and bullying the weak, but it is rather shy itself and as a result covers half of its face. ↑ Digimon Frontier: "My Painful Kick! Female Warrior Fairymon"
↑ Digimon Xros Wars: "Xros Girls!! The Mysterious Beauty, Nene!!" This page was last modified on 12 April 2019, at 22:01.